Ultimate Tinting Wakefield are specialists and as part of the Ultimate Tinting group, we aim to supply our clients with the best possible service available in the industry from start to finish. At Ultimate Tinting Wakefield we are driven and motivated by our customers satisfaction and we take great pride and care to achieve a very high standard of work. We strive to provide a happy and friendly service and we provide flexible appointments to suite everyone's needs. For any work involving commercial or residential buildings we will travel a great distance and for work carried out on vehicles we use a purpose and dedicated work shop in South Kirkby to ensure the best possible finish. 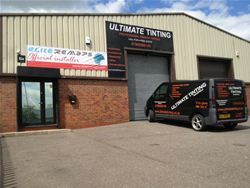 Ultimate Tinting Wakefield is fully insured for all aspect of work, and all our work is fully guaranteed. Ultimate Tinting Wakefield are proven to be a trust worthy company with a great work ethic by members of the public, the worlds biggest film suppliers and large companies we have worked with and contracted too. We were chosen and trusted to work with one of the biggest names in the industry demostrating window film aplications at road shows infront of hundreds of people which has lead to many other demo days for the same company. We were also chosen to work as part of a team on project in Spain were we transformed a seven million pound yacht to modenise it using window film and vinyl wrap. We have tinted 1000s of vehicles as well as offices, schools, conservatories. Please feel free to visit our gallery and our testomials to see what people have to say about us. We are a company that cares about our customers satisfaction and who take great pride in what we do. If you would like to speak to us regarding a free quote with no pushy sales tactics or ask any questions please get in touch using our contact details below.